Bostonians love their squares. One of the first things you'll notice is that few, if any, of them are actually "square." Most of them denote some intersection of congested streets and they are mostly covered by asphalt and heavy traffic. Some have lively street life, others might be just a convenience store and a bus stop. Still, they form a collection of loci for navigation around the infamously twisted and confusing streets of Boston. We don't have a grid; instead, we travel square-to-square. 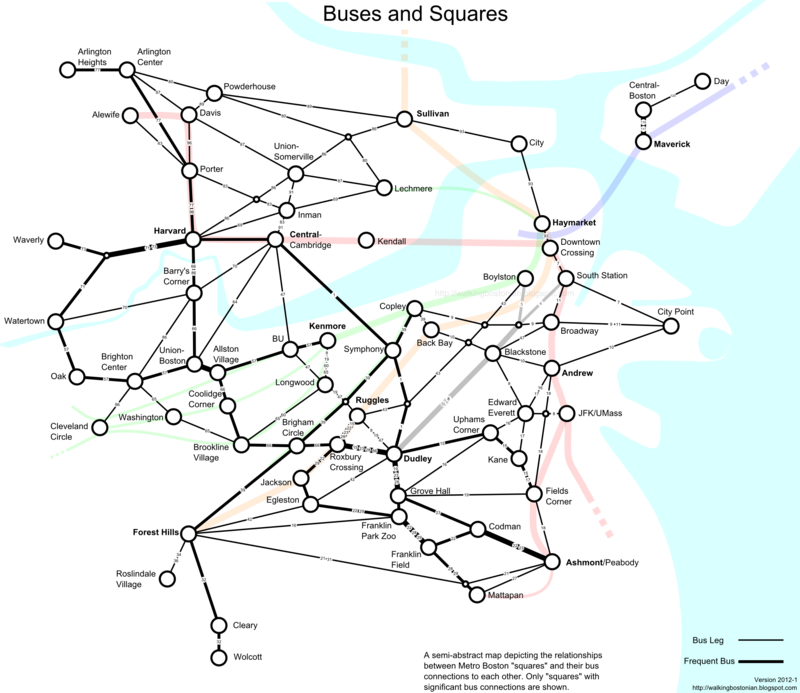 I've been thinking about ways to approach the MBTA bus network from this frame of reference. It's the mental map that I use when choosing a path to travel across the city, or when I want to consider my options given my current location. This map doesn't focus on the particular streets or curves in the geography of the route. Significant locations along the way are connection points to other buses. In Boston, it turns out, most of those can be found in one of the many squares. I began drawing this map by placing as many of the squares that I could remember off-hand. This got me maybe 80% of the way. Then I began adding bus routes based on their square-to-square travel patterns. Where they intersected, if I couldn't recall the name of a square there, then I attempted to look it up in the handy Unmapped Boston chart. Then it was a matter of adding context and tweaking the map to make it more informative. Unlike the typical transit map, this map de-emphasizes the rapid transit network and puts bus information foremost. Key bus routes are included, using thick lines, but there are also many less frequent bus routes which are still critical to the overall network. To keep this sane required some tough choices. The map definitely does not reflect the entire bus network -- far from it. Instead, I tried to stick to routes with a reasonable day and night span, and ones that fit into the overall theme of square hopping. The oversimplification of routes also keeps it from being too confusing, I hope, though it is still a fairly busy diagram. The style imitates a Harry Beck map in some ways. That type of map has long been a great boon for rapid transit travel, and I have been frustrated by the lack of such a map for non-key bus routes. So hopefully this map is useful in that respect. Also, while drawing it, I realized that it looked somewhat like a board game; all you need is a set of rules, some player pieces and a pair of dice. Is 'mixed use' becoming a watered down term? Is the MBTA actually being cost effective?